Family Office Services provides advanced case planning services to help you develop big cases and effectively collaborate with other advisers. We offer software, a proven process, and first-class deliverables. When working with your largest clients, conventional off the shelf software solutions are inadequate. They rarely, if ever, have the power and flexibility to illustrate and document your recommendations in a way that fully supports the key concepts with the nuance and flair you need to communicate that you report is truly unique and that you are in full command. The result is a client presentation that may appear unprofessional. Changes can be a nightmare due to the pernicious "ripple effect" that requires one to carefully inspect each and every page to see if and how one little change of input requires many changes downstream. This process is tedious, time consuming and error prone. To overcome these obstacles, we developed our proprietary CASE planning software to prepare a Family Wealth Blueprint®. The CASE software enables us to develop comprehensive client reports with fully integrated cash flows, income tax projections, net worth projections, estate tax estimation and estate distributions. All of this content is presented with world-class graphics, charts, explanations and supporting documentation. Every conceivable strategy or variation thereof can be fully customized for the client to learn more about each item available to you. 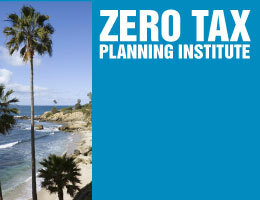 The Zero Tax Planning Institute equips advisers to replicate the success that we have in our retail practice. We show you how to develop successful seminars, attract attendees, schedule meetings with prospects, and engage new clients. We also show you how to charge fees, prepare client deliverables, implement plans, and fund trusts with investments and insurance. Zero Tax Planning is a program of Family Office Services, Inc. Zero Tax Planning is a simple but powerful concept that integrates well-established non-charitable tools (such as insurance, LLCs, low-interest notes, and irrevocable trusts) with common charitable tools (such as gift annuities, charitable remainder trusts, charitable lead trusts, private foundations, pooled income funds, etc.) to help clients reduce taxes while increasing potential benefits for family and favorite charities. Most clients can zero-out estate, gift and GST taxes through the appropriate leveraging of standard estate and gift tax exemptions. Other charitable and business income tax strategies can be used to zero-out taxes on capital gains income and/or the portion of their income not needed for lifestyle expenses. It is not difficult to zero-out taxes simply by giving wealth to charity. Amazing opportunities arise, however, when the tax benefits of statutory charitable tools are combined with the tax benefits of non-charitable instruments described in the Internal Revenue Code. Family Office Law LLP ("FOL") attorneys and their affiliates do not recommend strategies that lack substantial legal authority.